My mother came from Havana Cuba after a member of Castro’s staff told her to take her son and leave the country. This was 1959. Ana Srebrenik was a single mother and shop owner. She ran a little lingerie store in the lobby of, what was then, the Havana Hilton. Castro and his team had their offices in the building, and every day (as I remember her telling me), she’d see he and his minions walk through the hotel after their day in the mountains. She got to know his side men casually. One of them gave her the heads up about the revolution and how her capitalist ways were no longer going to cut it in post Revolution Cuba. My mother immigrated to the US and settled in New York and built another business. This time it was a dress shop in White Plains. This time she designed some of the clothes and hired a tailor to run them up for her store. I believe she had a partner in this venture because I used to hear about a couple with whom she had to settle when the store closed. Their names are forgotten. Ana placed her career on a shelf, met my father, got married and had me. Maybe it wasn’t all in that order. I’m never sure. Details got fuzzy. When she was alive, she wouldn’t go into detail. I only knew she always thought she’d get back into her own store again. But she never did. When she passed away unexpectedly in November of 2009, I had to do what we all have to do once in our lives: clean out the family home, send things to donation, organize estate sales, sell off property. Among her things, I came upon a portfolio of her fashion sketchings. They were likely done after she gave up her store. She always loved clothes and good fashion although she never allowed herself to buy many things. Mom would re-purpose old clothes, re-design a skirt, or use a scarf as a belt. Like Little Edie Beale of ‘Grey Gardens’, she’d find a perfect outfit for the day. While going through these drawings, I see a creative side to my mother I had never explored. To me, she was the mom in the kitchen, the mom in the car driving me to school or to the store, the mom in the dark room. Her dreams stunted by responsibility placed upon her as a woman of a certain generation. Each dressed devised by her hand evoked glamour and chance situations. There was a bit of glory and opportunity with each sash and button. The lines and shading promoted a dream world she wish she could step into, or to allow a potential customer to live empowered through a frock devised by her own vision. Yet, those ideas were left frozen on a page, hidden in a binder sitting at the bottom of a trunk. So many years ago, measured by the passage of time where she wouldn’t allow her true creative self to flourish. That it was her duty as a wife and mother at the time. That her way of handling a career and motherhood as a young single mother in Cuba caused a riff between her and her son. Not this time, she likely thought when she had me. So she shut the dream down. She encouraged me to be successful. She was proud of my athleticism and independence. I think back at the times she never brought up marriage and grandchildren. Never guilted me about it. She once even told me I should run my own business. But the everyday corporate life seemed like a societal obligation, having seen my father find security at IBM for entire career. How wrong I was. The world isn’t the same. I think of the song *”Days and Days” from the musical “Fun Home”. It’s sung by Helen Bechdel to her daughter Alison after dealing with her husband Bruce’s closeted life for so many years. She had just asked him for a divorce. Although the family circumstances are not the same as mine, the feeling of wasted days due to what was expected of her comes to light. Days and days and days. Just like my mother, married to a very nice, sweet, adorable man whom I worshiped, but held her to what was expected of her. He was likely resentful of her depression, not understanding what she needed. There is no one to blame really. But lessons are learned. Parents strive for their children to have a better life than the one they leave behind. I can hear my own mother say it in my ear. What are your dreams? What have you sacrificed in order to live a certain way? What creative activity have you allowed to sit on the shelf? And if you brought it out of the darkness to make it a part of your livelihood or your hobby, how will you continue to use that talent and never give up? ‘Days and Days’, from the musical ‘Fun Home’. Music by Jeanine Tesori. Words by Lisa Kron. Categories: Uncategorized | Tags: Ana, Ana From Havana, Bruce Bechdel, Cuba, Depression, Design, Dreams, Fashion, Fun Home, Havana, Helen Bechdel, Mental Illness, Moms, Mothers, Writing, Writing Prompt | Permalink. 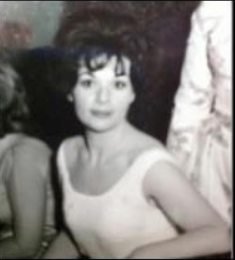 My mother at her wedding reception, 1962. On this day back in 1928 in Havana, Cuba – my mother was born. She was born to a father from Poland (with Bosnian roots) and a mother from Russia (Ottoman Empire). My grandparents were Jews whose path to Cuba happened when the United States quota of the early 1900’s delayed the immigration of various refugees from certain countries. Those with their sails set for America, were diverted to Cuba to wait it out. When the quotas were lifted, some moved on to the United States, while others – who adored the heat and sun of their pit stop – did not. What became known as “Hotel Cuba” – coined due to the refugees temporary status in a sun drenched country – became home. My mother loved Cuba. She was born and raised within its steamy palm trees, and the splashing waves over El Malecon. If anyone watched Conan O’Brien’s special on his trip to Havana – you’d have seen the beauty of the island. The people, the ragged charm, the sun baked streets and the nostalgic remnants of the past. A country frozen in time. That’s the country my mother called home – even as she made her life in America – after Castro kicked out capitalists and those who didn’t follow his socialist revolution. The only thing my mother was passionate about was Cuba and open relations with the United States. She imagined going back and meeting her neighbors who were holding on to her clothes and perfume. She wanted to visit her father’s grave. She wanted to be Ana from Havana again. Cuba was always in my house. WADO, the Latin radio station in New York was constantly on – the background music of my life. When President Obama opened relations with Cuba recently – it was one of the most mind blown days for me. Just thinking about what my mother would have said and done if she were still alive on that day. This was her dream. This was the news report she was dreaming to hear after she moved to the United States in 1959. I plan on traveling to Cuba in the next few years. As I’ve mentioned on this blog before – it’s my intention to visit her neighborhood in the Miramar district, and perhaps connect with the families of those who remember her and my family. I want to see the streets my mother walked, the atmosphere she fell in love with, the home where she lived and the grave where my grandfather was buried. Most of all, I want to get splashed by the torrid waves splashing over the sea all of El Malecon. Happy Birthday Mom! Cuba está abierta! Categories: Friday Gratitude | Tags: Cuba, Happy Birthday, Havana | Permalink. Thursday. It’s the Thursday of a slow and difficult week in terms of accomplishing my writing goals. Perhaps it’s the late summer doldrums. My body is still stuck in childhood, when summers were spent watching morning television, reading books from the library, discovering music, playing with friends and going to the local public pool. As an adult, I’m stuck in a routine of office work, and trying to get a Friday or Monday off during the hot months to keep my sanity. Sticking to my writing goals. Trying to write at least 1000 usable words for the book inspired by my mother’s life in Cuba called “The Sea Around”. It will be part one of a trilogy inspired by the stories of, not only my mother, but my father’s life as well. But first, Havana. My mother’s voice is over my shoulder. It feels like she’s saying, “You have to tell my story first! Write a book about me!” So, I spend some time each today writing about, and researching a country I’ve never been to. In recent years, Cuba has slowly opened its doors to tourists from America. It’s quite tempting to sign up for a tour of Havana, my mother’s home city. My intent would be to absorb the culture, the heat, the energy, the despair – to follow the footsteps of my mother’s life told in darkened rooms during her depressed evenings, stories that hang like myths in my imagination. Yet, the prices for tours are expensive. For a country so poor, I have to wonder where all that money is going. Ethics win out over financial draw backs for me. I decide to stay put in my current home of Los Angeles, and live vicariously and without abandon on Google Maps. Tourist shots of calles and avenidas paint a picture of my mother’s neighborhood in Miramar. The map gives me a vision of her landscape. While coming across various street shots of the shabby Victorian buildings, mixed with shattered shacks and contemporary apartments, some crumbling, others well maintained, it struck me how much Havana looks like Echo Park in Los Angeles. The blue skies and open horizons beyond the shallow rooftops. Tired palm trees line the streets. Some of them pop up in random places. Run down cars and jalopy pick up trucks so old and rusted, I can practically hear the music from ‘Sanford and Son’ playing as I imagine the sound of creaking shock absorbers crying for help while holding together bouncing bald tires. It reminds me of how pockets of Los Angeles remind me of New York – my home state. Just like a residential street in Havana looks like a side street near Elysian Park, L.A., there is a corner north west of La Brea and Beverly Boulevard that makes me feel like I’m back on Central Avenue in Hartsdale, New York, near what is know as “The Four Corners”. Both locations have a brick apartment building in the same spot. Both have gas stations nearby. Hartsdale’s corner has a Dunkin Donuts to it’s right, followed by the famous Hartsdale Pet Cemetery. The corner in Los Angeles has a strip mall with a major Kosher store that caters to the large Hasidim community that surrounds the region. Slightly altered specifics, but it still embodies the same energy – the same feeling – like I’m back home where my parents lived before they died four years ago. Back in familiar territory, where only a decade ago, my adult summers were enjoyed on weekends, away from my place in the city, back in Westchester County. That’s where I hung out by my parents’ condo pool, and befriended my now distant friend Marie. It’s where I found out about the local condo politics and listened to family stories spoken by neighbors with open hearts. It’s where I met my sweet, disturbed friend Eamonn (who inspired some of the stories in my forthcoming October book), who calls me once in a while to tell me about his progress in life. Different places in separate states or countries – yet they conjure the same feeling. Home is everywhere. Categories: The Sea Around Us | Tags: Cuba, Havana, the sea around us, Writing | Permalink. Categories: Uncategorized | Tags: Cuba, Cuban Jews, Havana | Permalink.